What does smiling have to do with your job and the workplace? A lorry full of tortoises collided with a van full of terrapins. It was a turtle disaster. Go on, smile! A simple smile can be the most powerful tool at our disposal… and we all have one. But what does smiling have to do with your job and the workplace? National Smile Month (16 May – 16 June) is the UK’s largest and longest-running campaign to promote good oral health. It aims to encourage all dental and health professionals, schools, community groups, colleges and workplaces to join in and help to educate, motivate and communicate positive oral health messages and improve the quality of smiles all around the UK. So, what does National Smile Month have to do with your job and the workplace? Your initial reaction might be absolutely nothing. You might even be thinking that it’s one of those fluffy projects that appears at work every now and then, and destined to cause severe embarrassment. Sound familiar? Have no fear. It’s more than that. National Smile Month is great fun, but it also carries a serious message, to promote and encourage good oral health and hygiene, which isn’t just profitable for the employee, it’s also beneficial to the employer too! Most problems with teeth and gums are preventable with a good oral health routine, but around 7% of the UK’s 29 million workforce have called in sick with teeth problems at least once in the past five years. Over two million people in the UK say they have taken time of work in the last five years due to poor oral health. Furthermore, Government statistics show that a quarter of all adults have not visited a dentist in the past two years and a similar number only brush their teeth once a day. Staggeringly, this means that poor oral health costs the UK economy around £36m every year! Bad oral health habits contribute to around three in every ten adults suffering regular dental pain and tooth decay. It is inevitable that significant numbers of people are taking sick days off work and damaging the productivity of the UK economy. There is an opportunity that would benefit both employers and employees, to increase awareness of oral health issues. An unhealthy workplace – physically and mentally – normally equals time off work and lost productivity. Thousands of people miss work because of their oral health. Frustratingly, it is a condition that is preventable. Two thirds of employees have less respect for a boss with bad oral hygiene. However, poor oral health is not just about toothache and decay. It has a much wider impact on general bodily health than you may think. Research over the past decade has revealed growing evidence linking poor oral health to serious health conditions, which account for many more days off work. Take a look how poor oral health can affect our general health, including heightened risk of heart disease, strokes and diabetes. Happiness and smiling in the workplace are considered by some to be a bit soft and fluffy. But where would you prefer to work? And who could argue against an increasing body of opinion that a happier workplace is a more positive and productive workplace? So what are the benefits of smiling and laughter? Most successful organisations care about their employees and nurture their health, safety and wellbeing. National Smile Month creates an opportunity to do just that. It can also support the development of a distinctive organisational culture and values associated with successful workplaces. Smiling and laughter relaxes the entire body and its muscles, relieving physical tensions and stress. Smiling and laughter boosts the immune system thereby decreasing stress hormones and increasing the level of antibodies that resist disease and illness. During busy working days laughter helps relax and recharge a person by reducing stress and increasing energy, allowing for greater focus and increased productivity. A positive attitude engenders spontaneity and the ability to think of solutions without the encumbrances of the problems being faced. Enables us to express our true feelings, thus allowing us relate more realistically and honestly to situations and demands. To learn more and find out how your workplace can take part in the campaign visit the National Smile Month website. You can also help your employees concerned about their oral health by passing on details about our free and independent Dental Helpline service – Smileline on 0845 063 1188. To learn more about how you can ensure your employees are healthy in the workplace and promoting a positive and supportive environment, attend our Mental Health Awareness training, London 6 June. Book now! 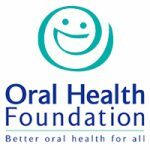 National Smile Month is organised and run by the Oral Health Foundation (previously British Dental Health Foundation), a leading national charity working to improve oral health.Our goal is to improve people’s lives by reducing the harm caused by oral diseases – many of which are entirely preventable.